A prehistoric monster shark that first appeared about 20 million years ago, megalodon, Carcharodon megalodon, is the largest meat-eating fish that ever lived. In the 1600s, the physician Nicholas Steno realized that the mysterious tongue stones that people thought belonged to snakes or dragons resembled shark teeth. Since then, by observing modern sharks and examining fossilized megalodon parts, scientists have learned about the creature's size, habitat and diet -- and the reasons it became extinct. With a 7-foot wide mouth, a megalodon shark made an easy meal of some whales. Scientists discovered fossilized whale bones with megalodon teeth marks on the bones. 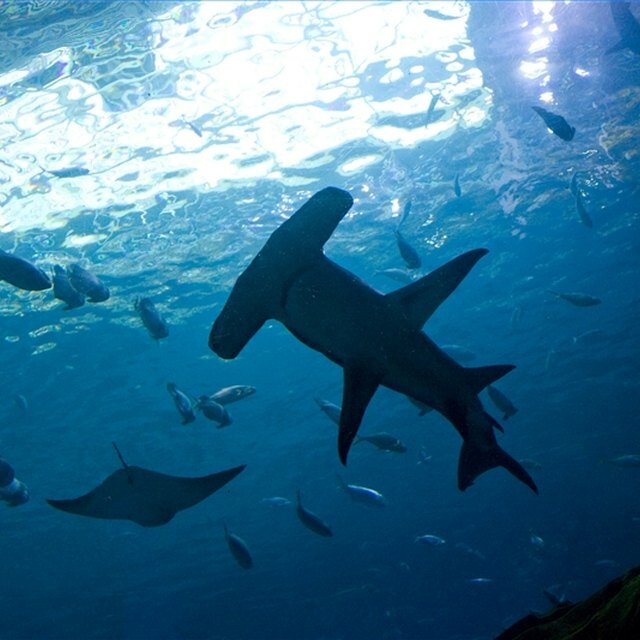 These sharks preferred warm waters for breeding, but usually lived in deep waters offshore. Scientists estimate a megalodon's size from fossils of its teeth and spine. Shark skeletons are made of cartilage, which breaks down quickly after death and only rarely survives as fossils, but many hundreds of fossil megalodon teeth have been found, as well as boney segments of its spine, called centra. By comparing these with modern sharks, scientists estimate megalodon grew about 45- to 60-feet long, or about the same size as a school bus, and weighed 50 to 77 tons. It had 46 front-row teeth, and because most sharks have six rows of teeth, scientists think it had about 276 teeth altogether in a mouth over 7-feet wide. Megalodon swam in the warm oceans of prehistoric Earth. Fossils of megalodon have been found in many places around the world, including the United States, Japan, Europe, Australia and Africa. Paleontologists -- scientists who study fossils -- concluded the giant shark swam in warm intercontinental oceans. If megalodon's habitat was the same as that of today's great white sharks', it lived in deep water offshore and traveled to warmer, more shallow waters to breed. In 2009, scientists discovered a megalodon nursery in Panama that contained fossilized teeth of juvenile megalodon. This evidence, together with earlier evidence of a breeding ground in South Carolina, led them to estimate a juvenile megalodon was about 20-feet long, or the size of a great white shark. Whales, seals, sea lions, walruses and other large marine mammals and fish were part of megalodon's diet. Whale bone fossils displaying serrated bite marks that fit megalodon teeth show that whales were a megalodon prey animal. Its jaws were so strong it could crush a whale skull as easily as you can eat a piece of fruit. Like large modern sharks, megalodon probably also ate other marine mammals and fish, surprising them by swimming quickly upward from deep water. Scientists think megalodon sharks ate more than 2,500 pounds of food a day. Megalodon sharks became extinct about 2 million years ago. Some scientists think falling ocean temperatures in the last ice age allowed whales, its main food source, to migrate to colder areas where megalodon sharks couldn't follow. These scientists also suggest that great white sharks, orcas and other predators killed so many juvenile megalodon sharks that eventually the species died out. Other scientists think the oceans became too cold for megalodon sharks to survive. Although megalodon probably looked like a great white shark, scientists still don't know whether the two animals are directly related or if megalodon had no direct relations and was an evolutionary dead end. Florida Museum of Natural History: Megalodon -- Largest Shark That Ever Lived! Green, Jenny. "Megalodon Facts for Kids." Sciencing, https://sciencing.com/megalodon-kids-5038897.html. 24 April 2018. Why Did the Megalodon Become Extinct?